Expose a Veiled Heritance plot to kill the Wilderking. 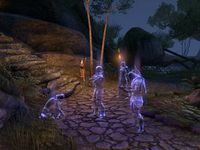 To learn why the Bosmer in this part of the Valenwood are opposed to the Dominion and to convince them to change their mind, I must negotiate with the Wilderking. "I hope I haven't given you a sense of false hope though. Bosmer 'round here petition the Wilderking for an audience all the time, and he rarely responds. More than likely, you're simply wasting your time." I understand, but I'd like to petition nonetheless. "Suit yourself. Just south of my home, you'll find the Petitioning Stone. Just touch it. Probably, nothing will happen. If he wants to speak with you though, he'll appear when you touch that stone." All I have to do is touch the stone? "I never said it was complicated. Besides, by scaring off those Wood Orcs, you just might have improved your chances. The Wilderking sees these things, you know. All right. Run along now. And may the forest part to reveal your path!" I'll just go touch the Petitioning Stone. "Welcome to my Court, outsider. Since you entered my domain, I have watched your actions with a keen interest. You have been generous with my people and more patient than I expected. But I still cannot gather one thing—why have you come?" I've come to negotiate on behalf of the Dominion. "Hmm. Again, not what I expected. I think I've heard of this … "Aldmeri Dominion", but I don't see how inclusion in this group would appeal to me or to the people in my domain. Aligning with you would only alienate us from others." You would only be alienated from our common enemies. "Interesting. You think we have common enemies? My only enemies are those who would seek to harm Valenwood. Let us test your theory though. Show me one of these enemies of whom you speak, so I might better understand." All right. How do I do that? "Use the other stone pillar. The one on the platform behind us. Touch that stone pillar and an apparition will appear. One of your enemies, as you say. Fight this enemy so that I might see its true nature." [Persuade] Can you give me any assistance in this fight? "I am pleased to be able to lend you strength to face this enemy from your past." "Now you are negotiating with a forest spirit who calls himself a king? With all those floating leaves, Hazazi thinks he looks very silly. Do you really think this is going somewhere? Or is it just a waste of time?" Possibly, but you're not helping very much. Even Razum-dar would have lost his patience by now! If you think all this makes sense, then Hazazi is starting to wonder about you too!" "I sensed the darkness in the heart of the one you fought, but he has already been defeated, has he not? And those like him … they may not all share his darkness. You should have me call these people enemies, though?" Yes. They are known as the Veiled Heritance. "The Veiled Heritance. Yes. I am familiar with this distinction as well. There is one among this group who has come to Valenwood to see me, and I find her curious … very curious. I am not inclined to consider her an enemy." Who is this person you're referring to? "She is one who has been blessed with fascinating gifts. Gifts I cannot afford to ignore. You would know her identity though. I was able to capture one of her memories. Touch the stone again and I will share it with you." Ondendil: "We have much need of someone like you, Aranias." Andur: "Yes, young one. We have a problem in the Valenwood that will require your talents specifically." Aranias: "I—I would be honored to help however I can." Andur: "An opportunity has arisen to strike a devastating blow to the Dominion, to divide the Bosmer." Ondendil: "The Bosmer in Greenshade claim allegiance not to King Camoran, but to a man they call "The Wilderking"." 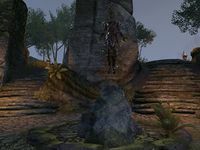 Andur: "Killing this Wilderking will drive the Bosmer mad. He is very elusive though, so I will need your help to find him." Estre: "You realize we are entrusting you with an important task, I hope, my dear." Aranias: "Of course, Lady Estre. You can count on me." "As you've just seen, the young girl—Aranias—is associated with the Veiled Heritance. Until I know more about her, I hesitate to call her an enemy. I will have more insight soon though. Even now, Aranias is on her way to my throne." But she's coming with Andur to destroy you. "So she believes, but there may be a greater truth to her purpose here. You may not like this, but I sense the same is true of you." The treethane says that all I need to do to petition for an audience with the Wilderking is to touch the Petitioning Stone. She's skeptical that he will come, but she says this is the only way. I touched the Petitioning Stone and the Wilderking appeared. I should speak to him. The Wilderking doesn't believe we have common enemies. He has asked me to touch the Stone Pillar on the platform above to summon and fight an enemy apparition so that he might see the nature of the Dominion's enemies. I summoned and defeated an apparition of the late Veiled Heritance member, Advisor Norion. I must speak to the Wilderking to find out if he now recognizes our common enemies. The Wilderking does not wish to align himself against the Veiled Heritance because one of the group's members is a person of interest to him. To learn this person's identity, I must watch the vision. Finishes quest The vision revealed that the Veiled Heritance sent Aranias and Andur here to kill the Wilderking, yet he still doesn't consider them enemies. I must speak to him about this. This page was last modified on 9 January 2019, at 11:16.